This stuff is ridiculous. It's so overpoweringly sweet. I only recommend making it if you're into that kind of thing, which you might be Just don't say I didn't warn you! This really does taste like Funfetti cake, and is a fun addition to a dessert or snack spread. 1. Melt the almond bark/chocolate in the microwave. I put it in the microwave in 30-second intervals, stirring between each 30 seconds until it is fully melted. 2. Add the vegetable shortening to the almond bark/chocolate and stir until it is melted. I usually don’t have to put it back in the microwave to completely melt it but you can if you have to. 3. Add the cake mix to the almond bark/chocolate. 4. Pour the coating onto the popcorn and coat evenly. I use 2 spoons and toss it almost like a salad. Pour the popcorn out onto cookie sheets to cool/harden. 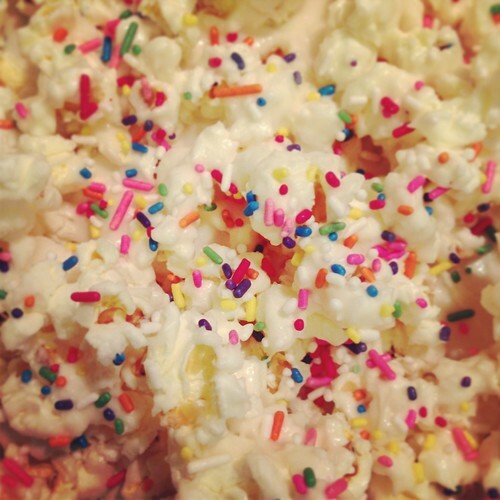 Sprinkle immediately with your choice of sprinkles. Wait until fully hardened and enjoy! Oh Heavens!!! I have to try this yummy-ness!!!! !